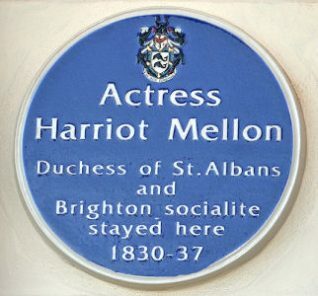 A Blue Plaque was unveiled today to mark the home of Harriot Beauclerk, Duchess of St Albans (née Mellon; 11 November 1777 – 6 August 1837). She was an actress who starred at many London theatres, including Drury Lane. Mellon was the daughter of strolling players, who went on to be a popular actress. When she was young, she appeared at the Duke Street Theatre, where she attracted the attention of an elderly wealthy banker, Thomas Coutts of Coutts & Co, the royal bank. Following his wife’s death in 1815 she married him. She was widely celebrated for her beauty, and was painted by George Romney and Sir Thomas Lawrence. In 1822, after her husband Thomas Coutts death, she became very wealthy, having been bequeathed his entire fortune, including his interest in the family bank. In 1827 she married William Beauclerk, 9th Duke of St Albans, who was 23 years her junior. As Duchess of St Albans, Harriot was a well known society hostess who owned several houses in London and Brighton. 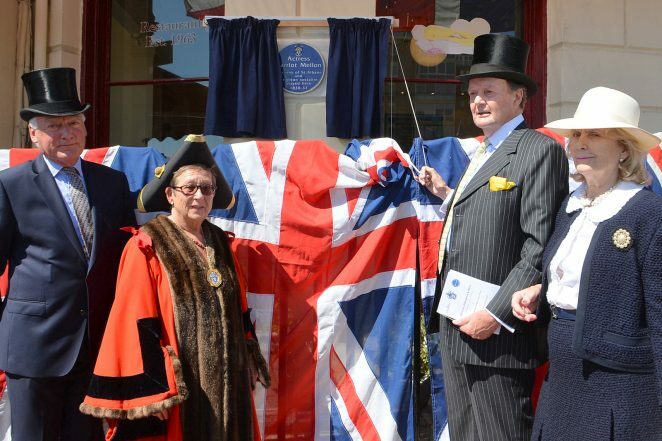 When in Brighton, she spent time at her house in Brighton, St Alban’s House, 131 Kings Road, on the corner of Regency Square. A fine photographic record and a very interesting history which is not, perhaps, widely known locally.